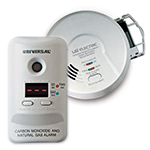 Studies show that one of the leading causes of preventable death due to smoke, fire and carbon monoxide is a deactivated or inoperable alarm. 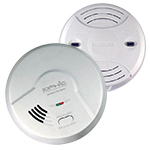 *USI 10 Year Sealed Battery Alarms provide ten years of protection upon activation not purchase. The availability of USI Ten Year Alarms that include U.S.S.T. Technology (select alarms) ensures families have access to dual protection from slow smoldering and fast flaming fires. All of these features in unison create an unparalleled defense in safeguarding any home or place of business from a series of threats. Patented Microprocessor Technology minimizes nuisance alarms while maintaining optimal efficiency in threat detection. Purchasing a USI Permanent Power 10 Year Sealed Battery Alarm saves you money and reduces environmental waste by replacing your alarms less frequently. 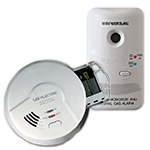 These alarms also eliminate the disposal of up to twenty 9-volt batteries. A nonexistent demand on replacement batteries opens a myriad of eco-friendly scenarios such as reducing the amount of environmental waste caused by disposable batteries. *USI Ten Year Sealed Battery Smoke and Carbon Monoxide Alarms ensure peace of mind with the inclusion of a 10 Year Warranty that covers BOTH alarm and battery. USI Electric Lithium-Free 10 year Power Alarms include the aforementioned features and a host of other patented technologies that can be instrumental in safeguarding any home or place of business. - Lithium Batteries are Dangerous: Why would you want them in your Smoke and Carbon Monoxide Alarms?